Equine Liniment: Equi-Block, Bigel Oil, Uptite, Vetrolin, Fungasol, Schreiner's Herbal, Numotizine! 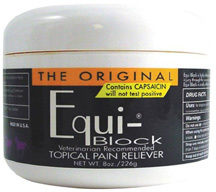 • Equi-Block Topical Pain Reliever: The number one equine topical pain reliever sold worldwide. Blocks more pain, decreases more inflammation, works faster, lasts longer (most horses receive up to 24 hours of pain relief), requires less product and less applications to achieve desired results! Will not scurf or blister and will absolutely not test positive. Has proven itself to be extremely effective on several kinds of degenerative joint diseases, and very effective at relieving soft tissue soreness. Equi-Block is very effective on hoof pain; it has the unique ability to decrease hoof inflammation. Simply and effectively takes away pain, which in turn greatly increases recovery time without the use of drugs. WARNINGS: For external use only. Avoid contact with eyes and mucous membranes. If Equi-Block gets in eyes, flush thoroughly with water. Do not apply to broken or irritated skin. Do not bandage. Do not apply to unaffected areas. Discontinue use if excessive irritation occurs. Do not use other than directed. If condition worsens, discontinue use and consult a veterinarian. Keep this and all drugs out of the reach of children. For animal use only. 8 oz. ORDER NOW! Active Ingredient: Capsaicin (0.025%). Other Ingredients: Deionized Water, Chamomile Extract, Carbomer 940, Polysorbate 20, Triethanolamine, Propyl Gallate, Methylparaben, Imidazolidinyl Urea, Propylparaben, Fragrance. • Equi-Block DT Daily Treatment: Equi-Block DT Formula (Daily Treatment) was specifically designed to treat long term chronic pain in a more cost-effective manner. It works wonders on horses suffering from debilitating diseases as well as pain stemming from old injuries. Capsaicin depletes Substance P. Remove the 'P' and you remove the pain. Since the DT Formula is a more liquid product, it delivers lower concentrations of Capsaicin. A regular and consistent application of DT maintains the depletion of Substance P, which is necessary to drastically reduce or eliminate chronic pain altogether. We recommend Equi-Block DT Formula (Daily Treatment) for the ongoing long-term treatment of recurrent aches and pains associated with arthritis, sprains, strains, or curb and splint pain in horses. 16 oz. ORDER NOW! CHRONIC PAIN MANAGEMENT: If you have never used Equi-Block DT Formula on your animal, we suggest you start with Racehorse Strength Equi-Block for the first week, three times daily. Remember to apply to the exact areas of lameness. Then cut back to twice a day in the second week. Finally, in week three, start applying the Equi-Block DT Formula two to three times daily as recommended. You will be amazed at the results! RACING AND PERFORMANCE TIPS: After each heavy workout, race or performance, rub your animal down with Equi-Block DT Formula. DT is a spectacular rest or sleep aid. Equi-Block DT relieves the animal of the typical aches and pains caused by over-exertion or stress. DT maintains the depletion of Substance P. Less 'P' means less pain and more sleep! Be sure to use Super Strength Equi-Tite Liniment on your horse's legs. For those of you in the Snow Belt or colder regions where the temperatures dip, trainers have been using DT as a performance rub for the major muscle groups. The feed back we have been getting is that the animals seem to like the warming sensation cause by the Capsaicin. This warming sensation would normally be too hot in warmer weather conditions. However, it appears that some animals under the colder conditions respond well to the added heat. Active Ingredients: Capsaicin (0.025%). Other Ingredients: Deionized water, Chamomile extract (Levonemol), Carbomer 934, Polysorbate 20, Triethanolamine, Methylparaben, Imidazolidinyl Urea, Propylparaben, Fragrance. • Equi-Block Leg Tightner & Liniment: A "feel good rub" that works as an anti-inflammatory and leg tightener, both of which are crucial for the performance horse. The high concentration of Menthol makes Equi-Tite Liniment unique -- quickly cools the muscle groups and tendons providing immediate comfort after strenuous activity. Menthol works by dilating the blood vessels that feed the joints. Increasing the blood flow not only cools but also helps feed oxygen and nutrients to the muscles. Contains Capsaicin in order to help knock out the pain, maintains the depletion of Substance P. Works absolute wonders on strained ligaments and tendons. Equi-Tite is quick and easy -- just rub the liniment into the desired area. There is no clean up! Bandaging is optional. Horses love it as a Liniment because it medicates and cools. Equi-Tite Liniment is indicated for the relief of minor aches and pains due to over-exertion, injury, arthritis, simple backache, sprains and strains of ligaments and tendons, curb and splint pain in horses. 16 oz. ORDER NOW! Active Ingredient: Menthol 3%. Inactive Ingredients: Purified Water, Isopropyl Alcohol, Chamomile Extract, Polysorbate 80, Olibanum Extract, Rosemary Oil, Capsicum Oleoresin, Carbomer, Trolamine, Methylparaben. PAIN RELIEF: Equi-Block Topical Pain Reliever, 8 oz. PAIN RELIEF: Equi-Block DT Daily Treatment, 16 oz. PAIN RELIEF: Equi-Block Leg Tightner & Liniment, 16 oz. • Bigel Oil: Bigeloil Liniment is recognized by professionals as an revitalizing rub that quickly invigorates circulation to help relieve sore muscles, tendons, and joints. Bigeloil Liniment helps reduce soreness from exertion or strain and the pain of arthritic joints.Bigeloil Liniment provides antiseptic properties and works as a refreshing brace or body wash for horses after strenuous muscular activity. An excellent choice when looking for an economical external analgesic. Bigeloil Liniment presents a pleasant scent. • Bigel Oil 16 oz: ORDER NOW! • Bigel Oil 32 oz: ORDER NOW! Active Ingredient: Menthol 1.25%. Other Ingredients Alcohol, Capsicum Tincture, D&C Green #5, FD&C Yellow #5, Fragrance, Juniperberry Oil, Methyl Salicylate, Salicylic Acid, Thymol and Purified Water. • Bigeloil® Liquid Gel: Has the same unique Bigeloil formula that acts as a highly effective rub to refresh and invigorate sore muscles, aches, strains, and arthritis . This super convenient fast-acting gel allows controlled application for treating localized pain. Can be used as external antiseptic and analgesic for minor cuts and abrasions. Can use with or without a wrap, absorbs quickly, and leaves no residue. 14 oz. #427947. ORDER NOW! Ingredients: Menthol 1.25%, Alcohol, Capsicum Tincture, D&c Green #5, Fd&c Yellow #5, Juniper Berry Oil, Methyl Salicylate, Salicylic Acid, Thymol And Water. LINIMENT: Bigel Oil 16 oz. LINIMENT: Bigel Oil 32 oz. LINIMENT: Bigeloil Liquid Gel, 14 oz. • RefreshMint Body Wash & Leg Brace: RefreshMint Body Wash & Leg Brace is a natural, revitalizing light liniment wash that efficiently cools your horse and cutting through tough dirt, grime, and sweat, leaving the coat clean and shiny without soap. RefreshMint Body Wash & Leg Brace is made with Spearmint, Menthol, Witch Hazel, and all-natural grain alcohol to cool, refresh, and clean. Mild enough to be used full strength under a porous wrap. No soap, no suds, no residue. 32 oz. ORDER NOW! Veterinary Liniment Gel: Absorbine Veterinary Liniment was originally formulated to soothe the muscles and improve the welfare of hardworking horses back in 1892. Veterinary Liniment is the world's best-selling horse liniment that offers fast relief of temporary muscular and joint soreness, tendons, and stiff joints. Deep penetrating heat calms the pain and swelling of tissues due to arthritis. Cleans and treats skin conditions like rain rot, scratches, and summer itch. Veterinary Liniment works as an antiseptic for minor cuts and helps prevent hoof and sole fungal and bacterial infections. Can be used directly from the bottle, or diluted for a soothing body wash. ORDER NOW! • Veterinary Liniment: 16 oz. ORDER NOW! • Veterinary Liniment: 32 oz. ORDER NOW! LINIMENT: RefreshMint® Body Wash & Brace, 32 oz. LINIMENT: Veterinary Liniment, 16 oz. LINIMENT: Veterinary Liniment, 32 oz. Ingredients: Extract of witch hazel bark and leaves, Arnica (Arnica montana), Rosemary (Rosmarinus officinalis), Lobelia (Lobelia inflata), Bergamot Blossom (Citrus aurantium L. subsp. bergamia), and Xanthan Gum. Ingredients: Extract of Witch Hazel Bark and leaves, Arnica (Arnica montana), Rosemary (Rosmarinus officinalis), Lobelia (Lobelia inflata), and Bergamot Blossom (Citrus aurantium L. subsp. bergamia). Ingredients: Bentonite (bowie type clay), Extract of Witch Hazel Bark and leaves, Arnica (Arnica montana), Rosemary (Rosmarinus officinalis), Lobelia (Lobelia inflata), Bergamot Blossom (Citrus aurantium L. subsp. bergamia), and Sodium Borate (as a preservative). LINIMENT: Sore Eze Gelotion, 12 oz. LINIMENT: Sore Eze Liniment, 16 oz. LINIMENT: Sore Eze Poultice, 5 lbs. UPTITE Poultice: UPTITE is a leg tightener and temporary relief from heat, swelling of the legs, soreness, cuts, burns, abrasions. As a general purpose to prevent common infections. UPTITE is a fast, non-irritating and non-toxic relief from swelling and soreness. Used on curbs, minor quarter cracks, suspensory heat and shin soreness, it promotes an excellent healthy tightener. UPTITE is applied in a more sparingly manner than a conventional clay which means a longer life and an easy removal with water. UPTITE is made with pure spring water "and it makes the difference". For Legs: After training, apply the preparation sparingly on knees, fetlocks, hocks, and tendons, moistening the area previously. In severe cases apply liberally to the area, when it is wet; cover with moistened brown paper and cotton bandage. Remove easily with water after 12-24 hours and repeat as necessary. For Feet: Apply a thin layer as an aid in maintaining moisture in the frog, solar surface and hoof wall. 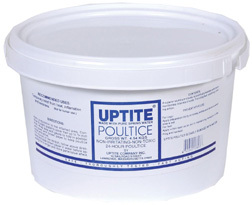 • UPTITE Poultice: 4 lb. ORDER NOW! • UPTITE Poultice: 9 lb. ORDER NOW! LINIMENT: UPTITE Poultice 4 lb. LINIMENT: UPTITE Poultice 9 lb. 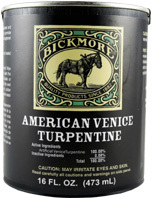 • Bickmore Venice Turpentine Pure: American Venice Turpentine is very effective disinfectant and antibacterial agent. It performs as a counter irritant to encourage circulation and new hoof growth. As a hoof pack or dressing it may be used as preventative care and for the treatment of quarter cracks and split hooves. Venice Turpentine helps in alleviating discomfort and soreness due to various hoof ailments. It may be painted on the soles of hooves as a toughener and helps reduce pain during vigorous exercise. 16 oz. ORDER NOW! LINIMENT: Bickmore Venice Turpentine Pure, 16 oz. • Vetrolin Liniment: Invigorating, aromatic liniment with a hint of green soap and 5 essential oils. Helps relieve minor stiffness, soreness and inflammation. Helps stimulate blood flow to sore ankles, knees and tendons. 32 oz. #80192. ORDER NOW! Active Ingredients: Camphor 3.4%, Methyl Salicylate 1.3%. Inactive Ingredients: Alcohol, Water, Green Soap, Oil of Sassafras, Oil of Spike, Oil of Cedarwood, Oil of Rosemary and Oil of Thyme. • Vetrolin Liniment Gel w/Hyaluronic Acid: Deep-penetrating liniment gel provides instant relief to sore muscles & joints with coat-nourishing hyaluronic acid. Easy-to-use gel formula produces a cool flash followed by soothing warmth that lasts for over an hour. Counter-irritant increases blood flow and stimulates circulation. Provides temporary relief of muscle soreness, stiffness or swelling. Added hyaluronic acid nourishes the coat, leaving a healthy-looking shine. 16 oz. ORDER NOW! Active Ingredients: Menthol 4.0%, Methylsulfonylmethane (MSM) 0.4% and Hyaluronic Acid (Sodium Salt) 10mg / fl.oz. Inactive Ingredients: Plant extracts of Calendula and Rosemary, oil of Cajuput (melaleuca leucadendron), Alcohol, Water, Thickeners, Benzyl Nicotinate, FD&C Yellow #5 and FD&C Blue #1. 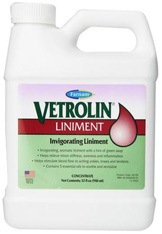 LINIMENT: Vetrolin Liniment, 32 oz. LINIMENT: Vetrolin Liniment Gel w/Hyaluronic Acid, 16 oz. • Excalibur Sheath Cleaner: Sheath cleaner for horses specifically developed to be fast and easy. Non-irritating cleanser contains Tea Tree Oil. Gently softens, loosens and removes smegma from horses' sheaths. Non-spermicidal, excellent for breeding stallions. Excellent spot remover and whitener. 16 oz. #82812. ORDER NOW! Ingredients: Surfactants, Tea Tree Oil. • Cool Pack Green Jelly Liniment: Original green cooling jelly for temporary relief of minor soreness and stiffness caused by overexertion. Cools, soothes and tightens and draws out soreness. Apply to shoulders, ankles, knees, suspensory ligaments, tendons and bucked shins. Good for sweats - will not blister.Thick jelly is easy to apply. 64 oz. ORDER NOW! • Reducine Absorbent: Reducine Absorbent is a counter-irritant for use for the temporary relief of minor stiffness or soreness. Acts a hoof dressing for restoring weak or thin walled hooves. Features the penetrating and anti-inflammatory properties of Iodine and Pine Tar. Reducine Absorbent helps stimulate blood flow and accelerate healing after an injury. Helps minimize swelling and pain during recovery. 16 oz. ORDER NOW! Ingredients: Pine Tar 47.5%, Iodine 2.0%, Potassium Iodine 2.5%. LINIMENT: Excalibur® Sheath Cleaner, 16 oz. 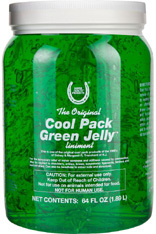 LINIMENT: Cool Pack Green Jelly Liniment, 64 oz. LINIMENT: Reducine Absorbent, 16 oz. Fungasol®: Fungasol® is gentle on your horse, but tough on bacteria and fungus. It’s specially formulated with advanced anti-fungal and anti-bacterial ingredients, along with tea tree oil to soothe. Fungasol® shampoo followed by Fungasol® Spray or Fungasol® Cream is the ideal treatment for pesky skin conditions such as girth itch, ringworm and rain rot. • Fungasol®: 13 oz. Cream. ORDER NOW! • Fungasol®: 32 oz. Sprayer. ORDER NOW! Natural Release Muscle Wash: Natural Release Muscle Wash is a fast-acting muscle relaxant spray, made with Magnesium Oil, Arnica, and Eucalyptus. Goes to work in minutes! Helps relief tension in stiff or strained muscles, joints, and ligaments. Reduces swelling due to muscle stress, inflammation, and bruising. Natural Release Muscle Wash can be sprayed directly onto affected areas, or use under your saddle or leg wraps. No heat, scent, menthol, or alcohol. Natural Release will begin reducing the ache within minutes. For chronic problems, reapply after 15 minutes, and then every 3-4 hours as needed. Natural Release Muscle Wash is water-based, not oily. 1. Use when there is obvious muscle strain or injury. Natural Release also decreases the inflammation that occurs around all soft tissue injuries. Spray a few times a day to release the muscle tension around the injury. This allows the animal to begin moving more naturally, which signals the body that it is time to switch from defense to offense, improving the recovery period. 2. Use under saddle. Before you ride - Spray poll, top line and sacrum (and any area showing signs of muscle stress and fatigue). This settles the muscles and gives the best possible stride and flexibility/range of motion. This is especially helpful for athlete horses (Jumpers, barrel racers, reiners, ropers, dressage, etc., who need full strides and instant sharp cornering. You can also spray the legs after a hard workout - or after trailering - to reduce muscle fatigue and tension. 3. Use during body work. Spray on tense areas and leave for 5-10 minutes. Upon your return you will notice a definite difference in the muscle tension. 4. Use Natural Release Muscle Wash before and after riding to help relieve fatigue and inflammation in joints and stiff muscles. Also use before and after trailering! • Natural Release Muscle Wash: 16 oz. Sprayer. ORDER NOW! • Natural Release Muscle Wash: 32 oz. Sprayer. ORDER NOW! Ingredients: All Natural Dead Sea Magnesium Oil, low-heat steeped Arnica and Eucalyptus..
Natural Release Muscle Wash 16 oz. & 32 oz. LINIMENT: Natural Release Muscle Wash, 16 oz. LINIMENT: Natural Release Muscle Wash, 32 oz. 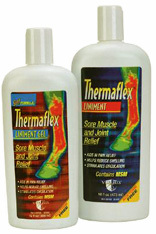 Thermaflex® Liniment: In studies, Thermaflex® was preferred by more horse owners over Absorbine®. Instant relief for sore muscles and joints. Helps reduce swelling and aids in pain relief. A cool rush of menthol followed by soothing, deep-penetrating heat stimulating circulation for longer-lasting heat therapy. Contains MSM and is 100% acetone-free. ORDER NOW! • Thermaflex Liniment: 16 oz. ORDER NOW! • Thermaflex Liniment: GEL. 12 oz. ORDER NOW! Ingredients: Menthol 4.0%, Methylsulfonylmethane (MSM), plant extracts of Calendula and Rosemary, Oil of Cajuput (melaleuca leucadendron). Other Igredients: Alcohol, Water, Thickeners, Benzyl Nicotinate, FD&C Yellow #5 and FD&C Blue #1. Liquid, 16 oz. | Gel, 12 oz. • Equine Oil #41: A great oil comprised of pure essential oils in coconut oil. Use to massage spinal column, on tired horses and use to help calm over-zealous horse by applying to nostrils.This calming oil is used by many farriers and dentists to calm the horse while they work. 8 oz. ORDER NOW! Ingredients: Coconut oil, Oregano oil, Frankincense oil, Lemon oil, Cinnamon oil, Eucalyptus oil, Clove oil, and Rosemary oil. LINIMENT: Equine Oil #41, 8 oz. • E3 Liniment Gel: Topical Pain Relief Gel, reduces swelling and sore muscles. Formulated with Nano Vitamins and 5% Menthol for superior fast acting pain relief. Veterinary strength and non-greasy herbal gel. 12 oz. ORDER NOW! Active Ingredients: Natural Menthol 5% and Alcohol 53%. LINIMENT: E3 Liniment Gel, 12 oz. Epsom Salt Poultice: Epsom Salt Poultice is a drawing agent for the external application for temporary relief of minor pains, bruises, and sprains related with muscle and joint injuries. Relieves soreness and relaxes muscles. Can be used on abscessed hooves. Apply to painful or swollen muscles, legs, joints or insect bites. 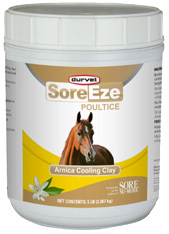 Durvet's Epsom Salt Poultice can be covered with cotton and/or wrapped. Will not burn or blister skin. Let draw and soothe for 36 to 48 hours. Repeat as needed for relief of soreness and swelling. ORDER NOW! Ingredients: Epsom Salt 60% and Methyl Salicylate 1.0%. In a water soluble base. • Epsom Salt Poultice Flow Gel: 20 oz. squeeze bottle for one-handed convenience! ORDER NOW! • Epsom Salt Poultice Jar: 20 oz. ORDER NOW! 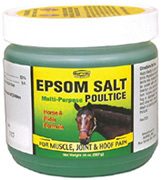 LINIMENT: Epsom Salt Poultice Flow Gel, 20 oz. • Corona Topical Analgesic Veterinary Liniment: Corona Veterinary Liniment is an remarkable horse liniment that helps temporarily reducing soreness, stiffness, and inflammation of muscles and achy joints. Made with Menthol and Eucalyptus help to stimulate circulation where applied. Contains botanical oils to help calm and revitalize. The lotion stays in place making it easy to massage into muscles and legs. Corona Veterinary Liniment is for use on all working, racing, or performance horses and dogs. (Formerly known as Horseman’s Dream Veterinary Liniment). 16 oz. squeeze bottle. ORDER NOW! Active Ingredients: Eucalyptus Oil 3.1%, Menthol 0.49%. Inactive Ingredients: Allantoin, Aloe Powder, Ascorbic Acid, Camphor Oil White, Isopropyl Alcohol, Isopropyl Palmitate, Methylparaben, Polysorbate-80, Purified Water, Propylene Glycol, Propylparaben, Triethanolamine, Ultrez-10 Powder, may contain citric acid. LINIMENT: Corona Topical Analgesic Veterinary Liniment, 16 oz. 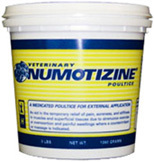 Numotizine Medicated Poultice: For use as a topical analgesic. Provides temporary relief of muscle pain, soreness and stiffness. Effective on strains, sprains, bruises, ligament and tendon injuries. For use following strenuous exercise or overexertion. Useful as a counterirritant in treating painful swelling or when massage is indicated. Also commonly applied to bites, abscesses and areas of fresh muscular injury. Useful as a hoof packing to draw out heat and inflammation. ORDER NOW! • Numotizine Medicated Poultice: 24 oz. ORDER NOW! • Numotizine Medicated Poultice: 3 lb. ORDER NOW! Active Ingredients. Menthol 1.25%. Inactive Ingredients. Clay, Color, Fragrance of Guaiacol, Methyl Guaiacol and Oil of Wintergreen, Polyols. LINIMENT: Numotize Medicated Poultice, 24 oz. LINIMENT: NumotizeMedicated Poultice , 3 lb. Mineral Ice Super Leg & Body Freeze: A time proven pain fighter that delivers performance in one word — RELIEF. Cool, fast, temporary relief of minor aches and pains. Reduces muscle and joint pain associated with arthritis, injuries, sprains, strains and bruises. Relieves minor soreness and stiffness from exercise and performing activities. All natural water based menthol formula contains no steroids or Benzocaine. Can be used as a therapeutic "cool down" body wash or brace. • Mineral Ice: 1 lb. ORDER NOW! • Mineral Ice: 5 lb. ORDER NOW! Active ingredient: Menthol 2%. Other ingredients: Ammonium Hydroxide, Carbomer 934, Cupic Sulfate, FD&C Blue No. 1, Isopropyl Alcohol 11.2%, Magnesium Sulfate, Sodium Hydroxide, Thymol, D.I. Water. LINIMENT: Mineral Ice, 1 lb. 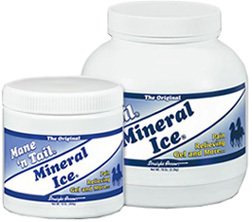 LINIMENT: Mineral Ice, 5 lb. Schreiner's Herbal Solution: Schreiner’s Herbal Solution is a simple, safe, and effective topical herbal application for horses and farm stock. Schreiner’s encourages healing in open wounds, post-surgical sites, cuts, fungi, and other skin infections. The formula has been recommended by veterinarians for over 20 years. By fighting infection and removing proud flesh, Schreiner’s makes the healing time a shorter and more comfortable process. Schreiner’s Herbal Solution is a wonderful substitute to patent medicines. • Schreiner's Herbal Solution: 8.5 oz. sprayer. ORDER NOW! • Schreiner's Herbal Solution: 16 oz. Refill. ORDER NOW! ingredients: Aloe Vera, Myrrh, Goldenseal, Comfrey, Cayenne (a source of Capsaicin) and Elder in a light Isopropyl Alcohol base..
LINIMENT: Schreiner's Herbal Solution, 8.5 oz. LINIMENT: Schreiner's Herbal Solution, 16 oz. • B-Oil Refreshing Body Wash & Leg Liniment: B-Oil is a superb all natural counter-irritant liniment and body brace. Can be used to help speed up the relief of minor muscle soreness, haunches and loins. B-Oil™'s counterirritant properties are due to ingredients such as: Juniper Oil, Salicylic Acid, Vitamin A and Pine Oil help relieve stiffness and soreness due to overexertion. Also used as a refreshing brace or body wash. 32 oz. ORDER NOW! • EZ Willow Gel Liniment: EZ-Willow Liniment is blended with essential oils, Arnica Montana, MSM, White Willow, Yerba mate, Methyl Salicylate in a cooling gel base that can be used for any minor soreness, lameness, or swelling due to overexertion. EZ-Willow Liniment may be used over any muscles, back and shoulders and used on legs, over joints, tendons, ligaments and on coronary bands. 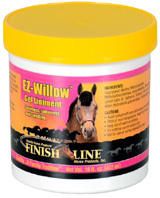 EZ-WillowTM Liniment will not scurf or blister and may be used on a daily basis. May be used before and/or after exercise, under wraps or may be covered. 16 oz. ORDER NOW! Water, Hydrophyllic polymer base, Triethanolamine. LINIMENT: B-Oil Leg Liniment, 32 oz. LINIMENT: EZ Willow Gel Liniment, 16 oz.